Towards the end of May and the beginning of summer as my fiancé, (you remember Mr. Donut don’t you? ), and I were having a casual conversation over dinner we decided to get married. Not eventually, not in 2013 like we originally planned, but immediately. At first we wanted to have a surprise wedding, where we would invite everyone over for dinner and then take them outside for a backyard wedding. Surprise! And there goes my Mamaw and Mr. Donut’s Abuelita having heart attacks in the backyard. Not an image I could live with, so we decided to tell our closest friends and family of our small quant nuptial. After I assured my family and best friends that this was not a shotgun wedding, meaning I was not pregnant, they quickly warmed up to the idea of us getting married in two short months. Except all I kept hearing was are you sure? You’re positive you want a small wedding? HA! They know me so well, you see I have been affectionately named the mini Martha Stewart in my circle and they knew I always dreamt of a big lavish wedding that was strategically planned down to every last table runner and button on the flower girl’s shoes. Of course these details would be listed in at least a five inch binder color coded and laminated to give to one of my eight minions aka bridesmaids. Too much? Too crazy? I just could NOT see myself being a bridezilla and I knew having a small wedding would be perfect when I saw the look on Mr. Donut’s face at the mere mention of it. After 8 years together, 7 months engaged, and 2 short months of planning on August 13th, 2011 I became Mrs. Donut, and I have been living on a cloud ever since. That day was like a dream and even though the old me would have flipped out at the fact that it rained a bit, we almost ran out of food (because I swear people came up in there like they hadn’t eaten in days), and someone cut and ate a slice of Mr. Donut and I’s wedding cake before we could, it was everything I ever imagined. I was and still am overwhelmed at all the love that surrounded us on that day, and I will never forget that feeling. Hearing my sister recite some of my favorite quotes from letters Mr. Donut and I wrote to each other throughout the years, having my Aunt, who is like a second mother to me officiate our marriage, seeing the tears of joy welling up in my Mamaw’s eyes, and the smile that my future husband gave to me as I walked towards him down the aisle are memories that will stay with me forever. So in celebration of us tying the knot, I made NACHOS! I know, after the collage of my wedding you probably wouldn’t immediately think of Nachos, but it was one of the first meals I ever made for Mr. Donut, and if he could eat them every day he would. Not to mention the fact that we are both HUGE Redskin fans and tonight we (they) are playing our ultimate rival the Dallas Cowgirls. I thought these would be perfect for tonight’s game! This recipe is super easy and won’t break the bank or take long to prepare before game time. 1-2 Bags of your favorite tortilla chips – please note there is going to be A LOT of ingredients sitting on top of these chips so try to choose chips that are not too thin, or you will need to eat them very quickly to avoid soggy nachos. 1-2 lbs. total of any meat of your choice -could be ground beef, leftover pulled chicken, chorizo (sausage), ground turkey breast (because its healthier), your favorite faux meat (for my vegetarians out there), or go crazy and do a mix of 2-3 or all of them. 2 cans of beans –again the combinations/types of beans are endless but I personally love black and/or kidney beans. 1 bag of pre-packaged shredded cheese – I find that the Mexican blends melt faster, so any mix of cheddar, monterrey jack, etc. is great. Then again I love cheese so you could throw asiago, pepper jack and mozzarella in the mix I would not be offended. 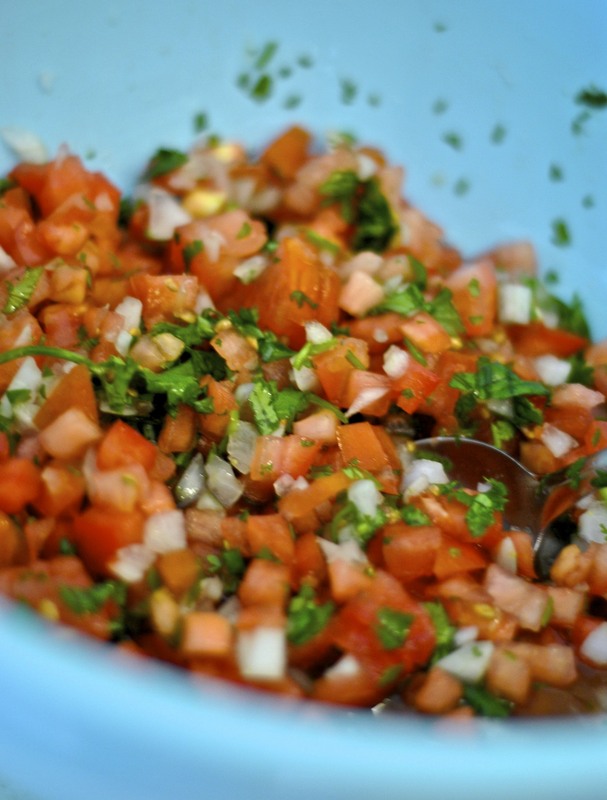 1 heaping of Chimol – Salvadoran Salsa, like pico de gallo but better. This is totally my very biased opinion. Recipe to follow. ½ cup – 1 cup of Jalapeños – Fresh or canned, and if you do not like super spicy foods remove as many seeds as need to bring the level of hotness down. 1 cup of Ranch Sour Cream – I mix half of one packet of ranch dressing mix for ever cup of sour cream, so if you are making this for a crowd, use two cups of sour cream, and one whole packet of ranch mix (usually have them in the spice aisle at the grocery store). Recipe for Chimol – I usually make a lot because it goes great with a variety of meals so I have no problem using the leftovers. In a medium bowl add the diced tomatoes, onions and cilantro. If you have not already juiced the limes separately, squeeze the juice over the mixture. Stir, adding salt to taste. You can use more lime juice if needed depending on the ripeness of the limes. Cover and let stand for at least 15 minutes or so, place leftovers in the fridge. It will taste even better tomorrow, so this can definitely be made in advance. We’ll start with the beans as it does not take long for the meat to cook. Some people rinse their canned beans but I don’t because we are making refried beans and the juice helps to keep them thick. So we’re gonna use it all! Dice the small onion, doesn’t have to be perfect as we will be blending the bean/onion mixture. In a medium sauce pan on medium-high heat, add about 3 tablespoons of oil (vegetable, canola, olive, doesn’t matter), let the oil heat (about 1 minute) and then add the diced onions. Stir, after about 3 minutes; the onions will begin to appear translucent, add the 2 cans of beans. Stir. My secret to quick flavorful beans is bouillon cubes. Depending on how much you are making 1-2 cubes should be enough. Add to beans and let cook until dissolved. Once the beans are heated, use a hand mixer or throw them into a food processor or blender. Blend until beans are liquified. In the same sauce pan heat another tablespoon of oil and place the beans back into the pot. Let heat on medium for an additional 5-10 minutes. Turn the heat to low, cover and let simmer until ready to use. Now place the meat of your choice in a sauté pan, if you are using beef you will not need to use any oil to grease your pan. Add garlic powder, pepper to taste, and once browned add chili mix. Stir until cooked through. You may need additional salt but again it is to taste. While the meat is cooking preheat the oven to about 275˚F. In a brownie dish, or any oven proof large plate, I generally use a deeper dish as to have enough room for the chips, beans, meat etc. Arrange the chips first in the dish then pour the beans over the chips, you do not need to use all the beans just enough so that each chip has some, do the same with the meat. Add cheese, and as much of it as you’d like. Place the dish in the over for about 10 minutes or until the cheese is melted. Take it out of the oven, and top with chimol, ranch sour cream, and jalapenos. If you do happen to have a deep dish, you can make multiple layers, following the same technique of chips, beans, meat, and cheese with the addition of the chimol, sour cream to the top layer. YUM! ← Cupcake Madness: The End.